oftwominds-Charles Hugh Smith: Is Risk-On About to Switch to Risk-Off? What Metric Are We Optimizing For? Are We Ready for Daily-Life Drones? Which Global Hegemon Is on Shifting Sands? Is Risk-On About to Switch to Risk-Off? What If the Easy Money Is Now on the Bear Side? Could the Alibaba Model Undo the Wal-Mart Model? Have We Reached a Financial Singularity? 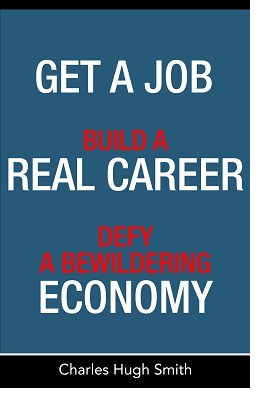 Cranking markets full of financial cocaine so they never correct simply sets up the crash-and-burn destruction of the addict. 1. Junk bonds. Two charts below (one from Lance Roberts and the second from Chris Kimble) suggest the risk-on extremes have reached the point of reversal. 2. Soaring U.S. dollar. Without going into detail, it's increasingly clear that the soaring USD is destabilizing the global foreign exchange (FX) markets. FX has been the source of many of the risk-on carry trades that have been driplines of financial cocaine for global stock markets. 3. Reversal of the Federal Reserve's quantitative easing (QE) programs.Though the stock market has roundly ignored the withdrawal of $600 billion of free money for financiers stock market stimulus all year, the October end of the QE asset buying program now looms large. The Fed has already trimmed its asset-buying binge from $85 billion/month ($1 trillion/year) to $25 billion/month. Risk-on proponents claim that this reduction has been replaced by Bank of Japan and European Central Bank QE programs, but this belief fails to take into account the diminishing returns on BOJ and ECB stimulus. THose spigots have been open for so long that adding more monetary stimulus no longer moves the needle positively. Rather, the extreme measures push the global fianncial system into increasingly risky territory. 4. Geopolitical spillover. One key element of the risk-on trade is the magical-thinking belief that the U.S. stock market is completely decoupled from geopolitical dynamics. In other words, Japan and Europe can sink into recession, China's growth can slow, the Mideast can be destabilized by multiple open conflicts and none of these issues will ever matter, as long as "the Fed has our backs," "corporate profits keep rising," etc. Geopolitics matter even if only because global dynamics cause global players to switch from risk-on to risk-off as markets destabilize and carry trades dry up. Highly leveraged traders must delever, and that selling on the margins tends to topple dominoes that lead straight to the core. 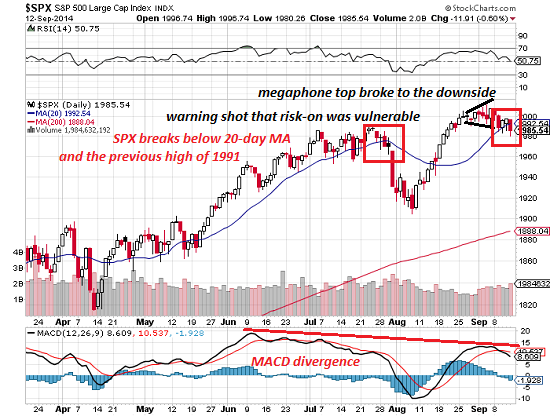 I've marked up a daily chart of the SPX (S&P 500) to show the megaphone topping pattern has broken lower, and the key support of the 20-day moving average (1992) and the previous high (1991) has been broken. The last time SPX broke below the 20-day MA, the market swooned in what now looks like a warning shot that the risk-on trade was at risk of reversing to risk-off. 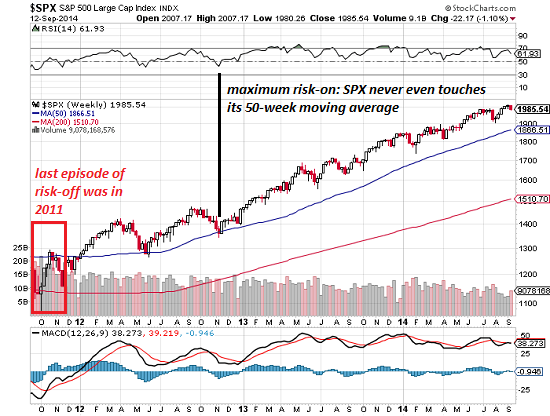 The weekly chart of SPX shows how long the risk-on trade has run. 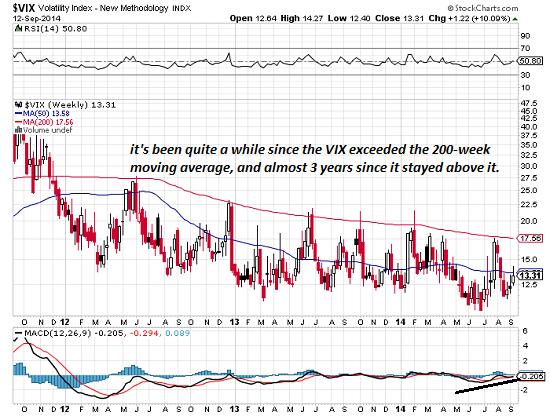 Markets typically touch their 50-week moving averages occasionally, just as a statistical mean reversion dynamic. The SPX hasn't kissed its 50-week MA since late 2012, and hasn't visited its 200-week moving average since 2011. Even the most avid Bulls should grasp that market corrections of 10% to 20% are statistical features of all markets. Cranking markets full of financial cocaine so they never correct simply sets up the crash-and-burn destruction of the addict. Thank you, Robert B. ($15), for your much-appreciated generous contribution to this site -- I am greatly honored by your steadfast support and readership. Thank you, Steve D. ($5/month), for your superbly generous subscription to this site -- I am greatly honored by your support and readership.